MINNEAPOLIS, Minn. – No. 2 Texas Volleyball (27-2) defeated No. 7 North Carolina (29-3), 3-1 (25-21, 18-25, 25-20, 31-29) on Saturday to advance to its third-straight NCAA Semifinal and sixth in the last seven years. Seniors Haley Eckerman and Khat Bell led the Longhorns with 14 and 12 kills, respectively, both hitting .200 or better. Junior Amy Neal posted her fourth double-double of the season with 11 kills and 15 digs. Sophomore Chiaka Ogbogu also finished with double-digit kills with 10 and led the Longhorns in hitting percentage at .421. Junior Molly McCage had a team-high seven blocks and Ogbogu added six, while freshman Cat McCoy finished with 11 digs. Sophomores Nicole Dalton and Chloe Collins posted 27 and 23 assists, respectively. As a team, Texas out-hit North Carolina, .272 to .225 and out-blocked the Tar Heels, 13.0 to 10.0. In the first set, Texas and North Carolina traded points with neither team leading by more than two, until the Longhorns created some separation and took a four-point lead at 10-6. The Tar Heels were able to cut the deficit to within two at 11-9, but Texas went on a 4-1 run to take a five-point lead. UNC could not recover and the Longhorns took set one, 25-21. It was all North Carolina in the second set as the Tar Heels jumped out to a 5-0 lead to start and led the rest of the way. Texas cut the lead to within two on eight different occasions, but could not close the gap completely and UNC took set two, 25-18. UT hit .156 in the second set after hitting .235 in the first. The third set was a different story, as the Longhorns took the lead early, winning the first three points and leading by as much as five, three different times. When Texas led, 17-12, the Tar Heels executed a 4-0 run to pull within two. UT retaliated, but North Carolina stayed close until the Longhorns closed out the set on a 5-0 run, 25-20. In the fourth set, Texas and North Carolina stayed even until the Longhorns went on a 4-0 run to lead, 15-11. The Tarheels did not fold and chipped away to tie the score at 19-19 and then took the lead at 23-21. They traded points until UNC had two set points at 24-22. Texas fought back to even the score at 24, but North Carolina had another chance at 25-24. 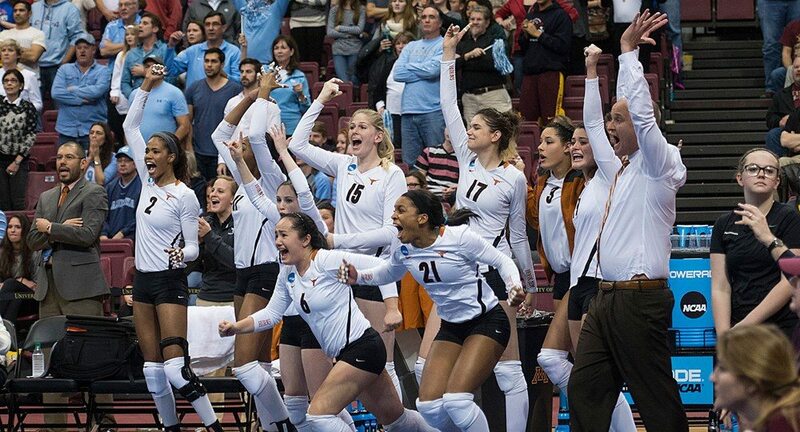 The Longhorns evened the score once again and this time took a 26-25 lead on a Bell kill. Texas had five match points before putting the set and the match away 31-29. The Longhorns will face BYU on Thursday, Dec. 18 at 6 p.m. CT in Oklahoma City, Okla.
"First of all, hats off to Carolina. That was an absolute war that we were just in. Joe has done such a terrific job with that program and it's so exciting to see him get to this level. They're a team that's going to be very good again next year because they're very young. But only one team gets to move forward, and toward the end of that match in set four, we played with a lot of heart, we were very steady and we made big plays. For the sport of volleyball – if that doesn't get you excited, I don't know what I can do for you. We were able to stay emotionally tough, which is something we've talked about from the very beginning of the season." "The day before this match specifically is always the worst 24 hours as a coach because there's so much riding on it. I went for a walk after last night's match and reflected on the players before that helped create this. It's remarkable. It's a tribute to the young women that we have in here. We've got a family atmosphere here and I'm very proud of it." "Our serve/receive struggled for a stretch there. I just said in the locker room actually how proud I was of Amy because they had her on her heels for a little bit, but she took a deep breath and she got herself back into it. We didn't manage our game that well in that set, and we couldn't put balls away. At this level, if you don't execute for short windows, it's going to be tough." "Chiaka is a major threat for us. She's really come on lately and has been big offensively for us. Khat Bell was exceptional tonight. Her numbers were good, but emotionally she was very stable for us. For Khat to be that emotional for us was big, especially as a senior to take that lead. That's what we needed tonight." "I think it just showed heart, it showed both teams were not going to give up and we were going to keep going. In the end we just looked each other in the eye and knowing 'OK next point', we can't keep living in the past, we have to move forward and we just have to go for it and give it our all and that's what we did. Every person, whether it was on the bench, the coaches, our staff, everybody just gave it all for us." "I think overall just everyone is giving it our all. In the locker room we are going to play for each other and it showed. We do that all the time and it feels great. Especially as a senior knowing that we are all giving to each other and that no matter what's in our way we are going to make sure we get past it to move on." "Whenever it was back and forth we looked at each other and said 'One ball, just focus on one ball at a time' and people were running all over the place it was crazy. But I think we also stayed calm and knew that we still had to manage our game and still make good swings and decisions and it worked out in the end." "Congratulations to the University of Texas. This was quite a battle; I think that was the best word to describe this. From the opening set that we played, to the second set that we were able to come back and win, to the third set, my memory takes me to that really long rally that went back and forth – just great volleyball, both teams fighting it out on both sides. I thought Texas did a really great job, they were a very physical team and if you were to tell me that we were going to be able to hold Eckerman to hitting .200 … I think that was pretty darn good. The fact that we were able to hold Texas to .272, we hit .225 against their block, we were in good shape. It came down to a great battle and I couldn't be any more proud of our team, of how we battled throughout the match, when there were times that looked like we were down, after losing the third set, and we battled back into the fourth set, we got it so close, had three set points, held Texas to five set points, and hold them off as long as possible, we ran out of substitutions, that just shows the heart and the grit that our team has and we've displayed all season long. I couldn't be any prouder of how this team has grown and where this team has gone. One of our missions this year was to be a team that was nationally relevant and I feel like we've accomplished that, and because of that I feel like that we've gained a lot from this experience and I know this hurts to lose this so close, and to be this close, but you need to be here, you need to experience it, and I couldn't ask for anymore from any one of these players. "Well I thought we did a pretty good job, early she had 14 kills, I didn't want to see her get into 20 and I thought we did a good job of that. She had one really impressive kill at the end of the match, prior to that I thought we kept her in check. It didn't seem like she was scoring at will – I thought that was what we needed to do. She had to take 40 swings to get 14 kills, so for me I thought we did a pretty good job. But they had a lot of other weapons, the thing that we had a little difficulty with was in the third set, stopping their middles. They were able to score on one-on-one situations. We were concerned about their outside, and I think that's where they were able to make a run during that third set. I thought we served well enough, they had to take some swings, Eckerman as well as Neal had to take some swings from pretty far off the net at times. "I think you have to go at it being aggressive, for sure. I mean a lot of times, even when we try to do shots and tips and stuff, they were still athletic enough to grab it and throw it down. So, I guess, just attacking it. A lot of times, with a big block, you have to hit up at it and go at it at different angles and can't hit straight into the seams and stuff like that, because they're big and go over the net and block those. So, just really being smart and hitting different angles and mixing it up." "It was definitely intense and that's what we wanted if we were going to go down at some time in this tournament; we wanted to go down because we were fighting and not just go down just because we were playing bad or just giving teams points. So, that was really important for us to fight all the way through, to never give up and to play our best volleyball." "I just want to thank God for the opportunity to be here. It's all you could ever ask for in a senior season. It's been great playing with Taylor and all the other girls and everyone one who's been alongside us. We made history. That's all I can say, and it's the most amazing feeling. You can't even put it into words." "We see huge blocks on the right side of practice everyday. We have two great practice players, and they play on the club team, and they block us all the time, so we're used to it."